Welcome to The Ethereal Gazette, the new home for creative writing regarding trolls, gerbils, fat horses and other assorted livestock. We hope you will find something amusing in our range of free writings. As we open our doors we are proud to greet you with a double header. As the site continually grows we hope to publish more Great Works of Art of this nature. The writings will be collected in the right hand side menu, for your convenience. We’re also looking for submissions, so feel free to check that page out too. Now, lets get the party started right. Head on down below and have a blast. Share & Enjoy! The Gerbil Incident – What happens when a small burrowing mammal meets a small stinky troll? The answer is: hilarity! The Ethereal Gazette presents The Gerbil Incident, which is the second installment of the series. A special warning for all your claustrophobics out there. The work is public domain, so share & enjoy. Click image to download your copy. 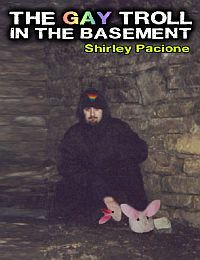 The Gay Troll In The Basement – Having a rampantly gay troll squatting in your basement can be such a nuisance. What’s a Grandmother to do? The Ethereal Gazette is proud to bring you this cautionary tale about the dangers of letting oversexed trolls cavort beneath your floorboards. The work is public domain, so share & enjoy. Click image to download your copy.